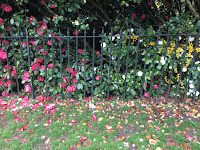 My (Sheila's) final liveblog from the LILAC Conference is Visual literacy and the expression-idea continuum will be a presentation from Vicky Grant, Amy Haworth and Ruth Mallalieu (University of Sheffield Library, so the library of my own university). Firstly Grant asked us what we could learn about visual literacy from LOLcats! She quoted Milner (2014) who talked about how LOLcats were an example of how people could convey ideas, emotions, identity through using images. Grant highlighted a move to student learning with a more active role, engaging more creatively and critically as a way of knowing. It is also part of being more inclusive and acknowledging the value of the everyday, and expression through the visual. Grant presented the practice of creative bricolage "the remixing of creative sources, through digital skills and tools". She used an example from her own doctoral research, which is exploring experience of Irritable Bowel Syndrome. Medical pictures of those with IBS usually present them as headless (showing the patient torso), so the people in her project created pictures of their heads and framed them in wood, like the formal portraits of male academics round the university. Mallalieu then talked about the expression/idea dichotomy: that the expression of an idea is subject to copyright (e.g. a drawing of a penguin with a blue beak), but the idea (e.g. of a penguin having a blue beak) is not. However, it may not be so clear cut in practice, and the issue is important given the growth in remix culture. 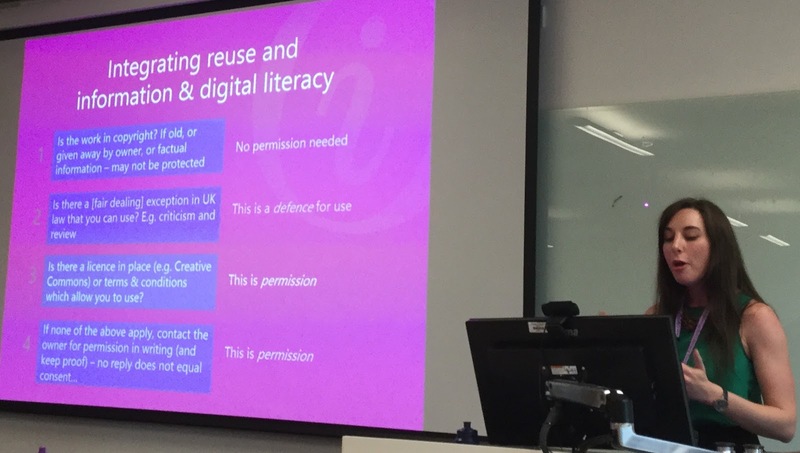 Finally Haworth talked about the Information and Digital Literacy framework developed and used at Sheffield University, which integrates visual literacy in the various elements of the framework. The library runs co-curricular workshops, including understanding and questioning images, and copyright of images. They also cover referencing and attributing images; creating and editing images (including both the practical tools and the ethical issues); and creating infographics. The subject guides include visual sources where appropriate (and where copyright allows!) There is a workshop on using images which is aimed at academic staff, and this has proved popular. They are scoping what they are doing against the Association of College and Research Libraries' current Visual Literacy Competency Standards for Higher Education http://www.ala.org/acrl/standards/visualliteracy (which is under revision). Pam Mckinney live-blogging from LILAC. In the last session today, Kate Courage and Catrina Matthews from the University of Warwick presented about their work to support undergraduate student researchers. A group of students, academic staff and library staff worked together to create videos to encourage students to engage with academic research. The Warwick Intrnational Higher Education Academy funded the project, where students worked as partners with staff to drive the content and direction of the videos. A series of workshops with the students took place, and these were used to design the approach to the videos and the content that they wanted to present. Three videos were created to represent stages along a journey to become an independent research. The students had creative control, and they wanted to make sure that the videos were engaging to young people, and weren’t just “boring talking heads”. The videos are used in induction sessions, in lectures and seminars and when students are starting their dissertation research. The project is being evaluated through interviews with academic staff and students, and with staff involved in the project. Staff felt the process really helped develop relationships between staff and students. 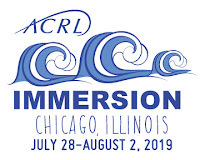 Sheila here, and the next presentation I'm attending at the LILAC Conference is from Nora Bird (University of North Carolina at Greensboro) on Transitions in Information Literacy: Understanding the Role of Dispositions. Bird started by talking her background as a practitioner and researcher. She went on to talk about Lloyd's concept of an information landscape, showing us pictures of some different types of landscape to stimulate ideas of how the information landscape might appear to librarians and non-librarians (e.g. that non-librarians might feel happy with a crowded jungle landscape, that seemed disorganised to librarians). She associated Lloyd's "social modalities" element with dispositions (as described in the ACRL IL Framework). After this, Bird explaned the US context; the levels of schooling and the ACRL Framework. She noted that the concept of knowledge practices and of dispositions had been incorporated in the Framework and that Carrick Enterprises (https://thresholdachievement.com/) recently developed the Threshold Achievement Test for Information Literacy (TILT). This identifies three levels: conditionally-, college- and research-ready, with various dispositions associated. In the test, dispositions are scored based on students' judgements on behaviours associated with those dispositions. In the research carried out by Bird, 233 students in an undergraduate LIS class took (I think) two test modules. She showed the pie charts of results for "mindful self reflection", "toleration of ambiguity" and "responsibility to community". For each of those, the largest number of respondents were in the middle scoring category. One notable finding was that students who attended middle college scored high on mindful self reflection. There were only 3 students with military experience, but they did score highly for community responsibility. Bird concluded that there are "intruiging ideas to explore" but no firm conclusions at this stage. There are big questions concerning, for example, whether librarians can educate for particular dispositions. Pam McKinney live-blogging from the second day of the LILAC conference: in this presentation Steph Grey and Trish Lacey from Public Health England knowledge and library services talk about tools to critically appraise visual materials. Public Health England is an evidence-driven organisation, using evidence from systematic reviews and other kinds of health research, and it’s important to use the right type of evidence for your question. Quality matters, so evaluation of evidence is really important. There are existing checklists that can be used to help evaluate health research studies, but sometimes in public health you need to use evidence that is outside the traditional gold standard of health information. Infographics are developed at public health England, and can be really useful for conveying a message with great impact. Infographics are collected as evidence, so there needs to be a way of evaluating them. No existing checklist to help evaluate infographics was found, so after a literature search one was created based on sources found. It covers questions such as “is it biased” “can you find the source of the information” and “can you understand the infographics without knowledge of the area”. Visualisation literacyis an important area for further research, because people interpret visual information differently. Pam McKinney continuing live blogging from this afternoon’s sessions at the LILAC conference: Karen Sobel and Lorrie Evans from the Auraria library in Colorado which serves the university of Colorado, metropolitan state university of Denver and the community college of Denver ran a workshop on using wicked problems to design IL teaching. They recommended a book “creating wicked students” by Paul Handstedt as a good introduction to using wicked problems in teaching. We discussed principles for turning big wicked learning objectives into learning objectives that could actually be accomplished in the classroom. They should involve relevant and obvious benefits, and they should involve collaboration and communication, it should involve challenge and creativity. An idea explored in the book is to nest higher and lower order thinking skills within teaching, so making sure that lower order skill are built before higher order skills are addressed. Ideas we had here were to use peer support in the classroom, to use images instead of text as a point of departure for discussion, giving instructions in a variety of formats and to use flipped learning to get students to understand key concepts before face to face sessions. It can be valuable to ask students to engage with non-scholarly sources and to compare and contrast the scholarly and non scholarly source covering the same subject - this approach was used very successfully in the psychology department at the university of Sheffield. This is Sheila, and a session about a serious game is my next one at the LILAC Conference. Darren Flynn, Becky Collins (presenters) and Samantha Clarke authored "It"s dangerous to go alone! Take this"; Developing a role-playing video game for library induction. This focuses on a game developed by Coventry University’s Lanchester Library and their Disruptive Media Learning Lab. The Bookrunner game can be played online at https://goo.gl/ccmYN5. The underlying plot is that the library system has become sentient and has locked down the library, and you have to liberate the librarians and get to leave the library. The presenters talkied about how and why it was created as an induction support (reasons included a more extended induction period, the opportunity for collaboration). A video game is scaleable (which a board game isn't) and doesn't involve a lot of input (unlike, e.g., an escape room). The game can be delivered with one librarian facilitating. Since it gets integrated into face to face teaching it was important it was time delimited. They thought about the pedagogy underpinning it. Kolb (experiential learning), Arnab et al (that the gameplay needs to match up with the learning; so the learner and game mechanics align), and Clarke et al (matching learning outcomes with game outcomes) were drawn on. The game engine was RPG Maker. The librarians listed the learning outcomes they wanted (having to cut down their original list), and then develop an outcome in the game to match each one. There also was an overarching storyline, to drive engagement and encourage people to play it all the way through. The writing was collaborative. The library is based closely on the actual library layout (to familiarise students with the physical library). Inspiring the story were previous scifi (e.g. 2001 a space odyssey), dealing with library anxiety, data scandals and also use of mini-quests. The game was used in a 2 hour induction session with business school students. They played it for about an hour, there were questions, and then there was a more traditional introduction to business databases. Students could also use the game independently via a LibGuide link. There was user testing, they looked at usage stats, and they did pre and post tests (during the taught sessions), with both quantitative and qualitative elements. In terms of usage stats, the largest use was by people following a link on a Libguide (although they do not have information on how far people progressed). In terms of the surveys: there was a notable post-test increase in confidence in finding the subject librarians' office (which has been an issue), and also an increase in confience in finding subject-specific sources and locating physical books and e-books. The qualitative responses were primarily positive, and the game seems to be memorable. The presenters noted that some students "got" the sci-fi related jokes and some didn't, but it didn't seem a barrier if they didn't. They are currently getting together the evaluation and will publish the findings. One learning point was not to underestimate how long it took to play the game; secondly, the more game testing the better; thirdly, to manage expectations (e.g. not assume students will be excited by the game) - they explain that this is an alternative to talk-and-chalk. In terms of future development: they want to do voiceovers; they are looking at other games to develop using RPG Maker (it needs to be reusable and can be used by a lot of students, to be worth the time/effort). They are considering developing a game for referencing, or literature searching. This is Sheila at the LILAC Conference. The session I'm in now is Unpacking international student information literacy: Recommendations for the design of intercultural teaching and learning opportunities, presented by Alison Hicks (University College London). The presentation is based on her doctoral research. Her dissertation is here. 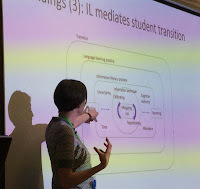 Using constructivist grounded theory and the theoretical frameworks of transition theory and practice theory she was exploring how information was made manifest by language learners and how information literacy helps students to mediate transition. The IL definition she adopted was Lloyd's, that IL is "a way of knowing the many environments that constitute an individual's being in the world". Her definition of "Transition" was taken from Gale & Parker "Change navigated by learners in their movement within and through a context". Hicks interviewed people from English-speaking countries, who were visiting a variety of countries (I think 14 countries were involved in all). She used photo elicitation, asking them to take photos that could be used as a stimulus for discussion in the interviews. Hicks discovered that students mediated these risks through IL. She described a practice of "calibrating"; observing and engaging with local people to find out things about the environment and etiquette, checking, and noting (making notes, taking photographs etc.). There was also the practice of "repositioning", to insert themselves into the environment, to deal with things emotionally (e.g. taking time out, connecting with people back home), archiving material. Finally Alison presented the model that emerged from the study (pictured) and proposed a theory of mitigating risk which "states that the pressures of residence abroad catalyse the enactment of information literacy practices, which subsequently mediate language-student transition from acting like to becoming a language learner within a new setting"
After a pause for us to discuss her ideas and provide some of our thoughts, Hicks went on to present her recommendations. Firstly, framing things in terms of "transition", focusing on scaffolding the transition process and the idea of the student recapturing their equilibrium. This means investigating what transition means and the place of IL and the library within that. Hicks pointed out that transition can be a positive, generative experience, and one should not just see it as negative. The 2nd recommendation was about "recognising that IL centres on negotiation rather than assimilation". Part of this is acknowleging the expertise and knowledge that the students already have. The 3rd recommendation was "design for sociality, connections and interaction". This included thinking about embodied information that can be valuable when learning about a culture. This all had implcations for IL teaching, avoiding thinking about international students as the problem. Hicks identified that it was valuable to draw on empirical research to inform IL education, rather than relying entirely on professional models and standards. 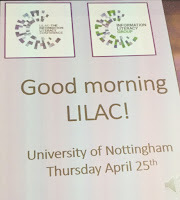 Pam McKinney here again live-blogging from the LILAC conference at the university of Nottingham. this afternoon I’m watching Daryl Toerien, head of libraries and archives, and David Harrow from Oakham School, a boarding school in the county of Rutland, UK. Changes in school leaders can have a big impact school libraries, from the amount of library funding, whether or not libraries have a professional librarian post, or even whether or not a school has a library at all. Seymour Papert was a researcher who has had a huge impact on children’s learning, and the intersections between learning and technology. He invented the LOGO robot and programming language. Seymour said “You can’t teach people everything they need to know. The best you can do is position them where they can find what they need to know when they need to know it.” The prevailing educational paradigm is teacher centred, but really an inquiry-based learner-centred educational process is more suitable for the future. Darryl introduced the FOSIL model of inquiry, based on the work of Barbara Stripling. The starting point for inquiry should be the “connect” stage which involves looking at what is already known. The international baccalaureate was developed out of a progressive approach to education that is based on constructivism, and as part of this students are required to write a 4000 words essay based on their original self-directed research, which is difficult to approach for students who have just finished the current GCSE curriculum. It is important to have a dedicated timetable to support for students undertaking the extended essay. It is very important that students reference their information correctly, and this academic skill is not adequately prepared for in pre-16 education. The New York City schools department has a really useful document that looks at the skills student need to develop to be effective inquirers. Darryl has used this to develop a framework for development of students across the years in the Oakham school, and to define when and where students should be taught the skills they need to develop their information literacy, and be prepared for the international baccalaureate. The challenge we face is that current A-level and GCSE curriculums in the UK do not focus on building inquiry competencies. This is Sheila, and today I'll be joining Pam in livebloggong from the LILAC Conference. The day opens with a keynote from Ruth Carlyle (Head of Library & Knowledge Services and Technology Enhanced Learning, Midlands and the East of England) on Health literacy: information literacy for life. She started by identifying us as "the perfect audience" to hear about health literacy. Carlyle went on to talk about the multiple health problems that face populations globally, and the need for people to be able to help themselves in terms of their health problems. She quoted the World Health Organization definition of health literacy, and noted that the emphasis now is not just on personal characteristics, but also the need for communities to work together to access, understand, appraise etc. haelth related information. There is a WHO health literacy site here https://www.who.int/healthpromotion/health-literacy/en/ She also cited research by Gill Rowlands which identified that there was a UK national average of 43% of the population not understanding textual information, with a larger percentage unable to understand a combination of information types. Gill Rowlands' eprint archive is here. There are similar findings from studies in other countries. The obvious implications are that people may not be able to self-medicate effectively nor make informed decisions about health. Carlyle cited Nutbeam's 3 types of health literacy: functional, interactive (including being able to "balance information from different sources") and critical ("analyse and gain control"). She also talked about when you are in a stressful situation, e.g. having just been diagnosed, this will affect your health literacy. Thus (using a framework by Carlyle herself) the Situation, your Skills and the Setting (e.g. a hospital) will all affect your health literacy, so you can be encouraged, empowered and enabled. Carlyle tried an experiment with us, showing us some notes of music and asking us to decode it, whilst continuing to talk to us, to demonstrate how frustrating and difficult it can be to decode information where you don't know what the code is. She then talked about some techniques that could be used to improve communication. An example was "teach back", asking the patient to explain in their own words, re-explain if needed, and asking again until everyone's happy. There was also "chunk and check" to check after each small chunk of information. In terms of written communication there were "common sense" guidelines such as using active verbs, using short sentences (although these common sense guidelines were not always followed in health materials). Health literacy friendly services will comply in terms of written communication, spoken communication (so support is evident and open), stock (e.g. up to date material in a range of formats), signage, training and policy ("policies for the services reflect the health literacy needs of staff and service users" and "HL policy for the service"). Training is provided to NHS librarians, so that they can support colleagues and they have a strategic framework "Knowledge for Healthcare" (I think this). The recent Topol Review (Preparing the healthcare workforce to deliver the digital future) stressed the need for digital literacy and e-health literacy, which (to us) relates to information literacy. 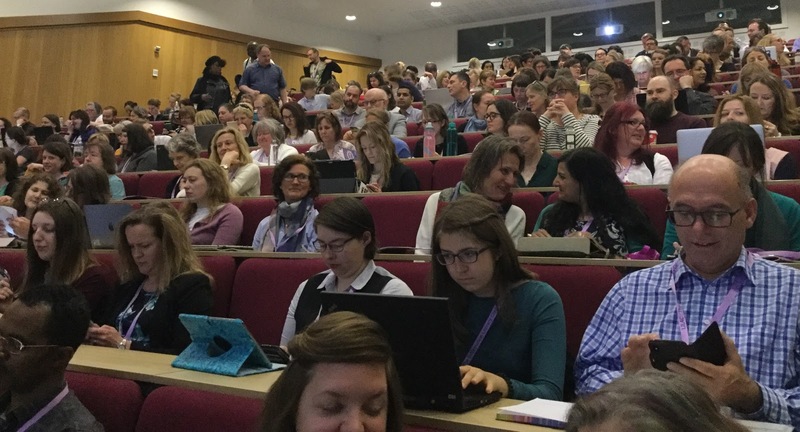 There was an interesting question session afterwards raising a variety of issues, including misinformation, findability of the NHS website, the extent to which clinicians are willing tp respect/involve librarians, and the scariness of actual medical situations that effects our judgement. 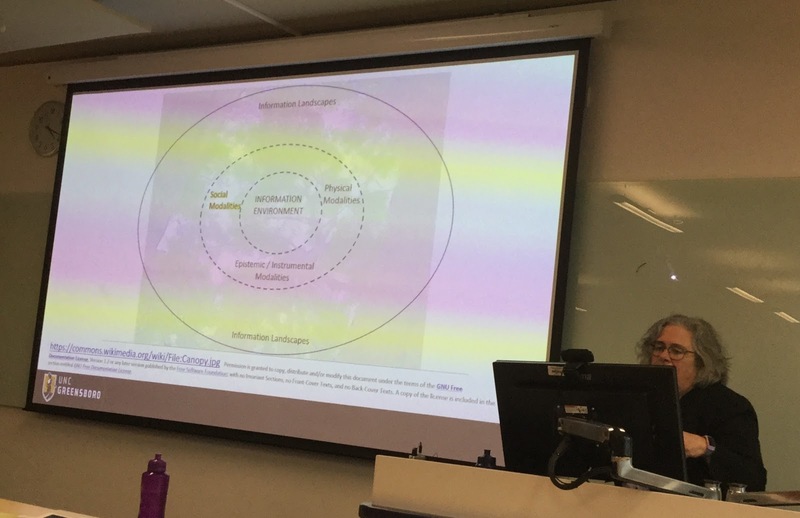 Sharon Perera and Andrew Sinclair presented on a moodle based resource “independent learners toolkit” that was developed to support students, and particularly BAME students, transition to university at Greenwich University. 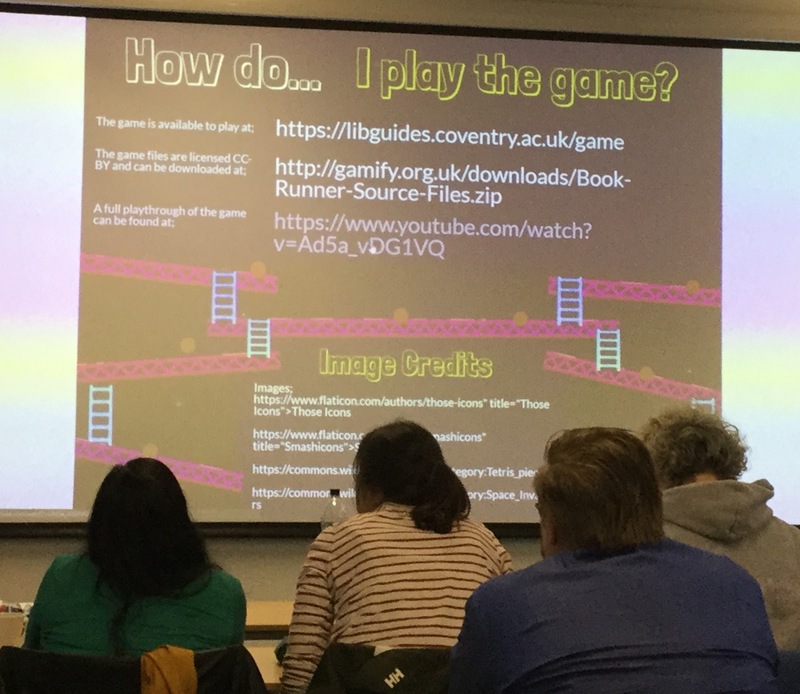 The resource features engaging interactive games to build awareness of university life, viewing the university as a socio cultural system of practices (Lloyd 2013) that attempts to bring out the tacit ways of knowing. 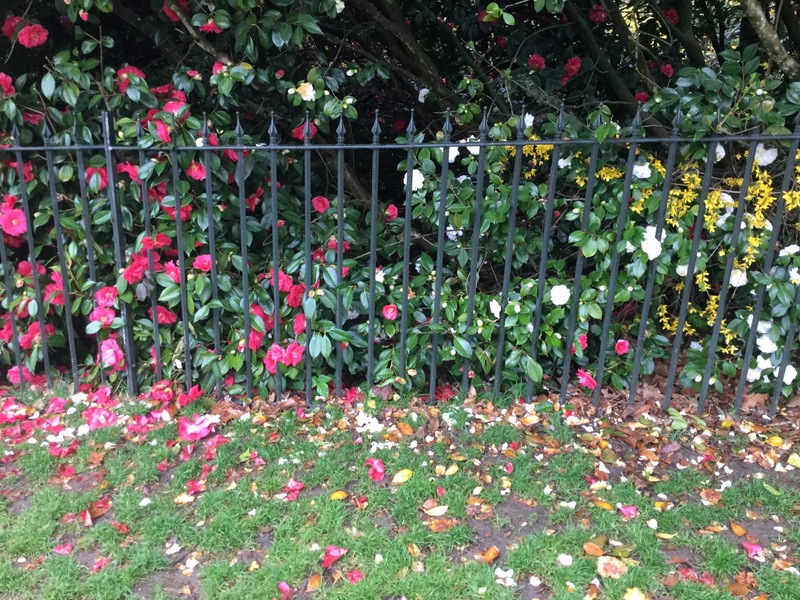 The resource can be used with groups of learners to facilitate discussion of the issues they are all facing, and make it obvious that everyone is in the same situation. They carried out an evaluation of the resource and gave a pre and post intervention questionnaire,which revealed that students became more confident about their knowledge of the skills they thought they needed at university. Students found it helpful, they liked the self discovery aspect, and thought it taught the things they were expected to already know, but didn’t. The resource is available for free use on the Greenwich University website. Cheryl Reynolds and Andrew Walsh from university of Huddersfield presented on the “flying start” initiative that supports transition to university. Often induction is a very didactive process, and they wanted to move away from this to a programme that was more inclusive and student centred, that helped students become part of a community at university. The flying start programme was part of a multi institutional programme funded by the UK office for students to promote early engagement and sense of belonging. Student participated in 9- 5 classes over the first 2 weeks of their course, which could be subject specific, but had similar principles (autonomy, tenacity etc). Many departments were involved including careers, the library, the students union, and development focused on 8 academic departments and impacted on 900 students. The programme was designed to stimulate excitement about the subject, develop an academic community, to encourage students to work with new people, and build approaches to university level study. The project helped build relationships across the university. Andrew presented some of the activities that the library facilitated over the 2 week induction period. Students were asked to use Lego to build a library, and then discuss their models, which helped draw out some of the fears students had about using the library. The challenge cards activity involved students working in groups of 2 or 3 to complete challenges e.g. “find the highest point on campus”. Activities were more about learning about each other and the spaces of the university than “formal” learning. The “Zines” activity involved students designing small informal magazines about the library, and what they thought a library is. The Groundhog Day activity used the actionBound app to develop a treasure hunt using GPS, QR codes and photos to stimulate students to use the library, replicating the kind of information that would normally be delivered at an induction session e.g taking a book out, finding the opening hours of the library. It was really important that librarians were involved in the multi professional team who developed the programme as a whole, which ensured that students were introduced to the library as a core part of their course. Students who took part in the programme had more positive perceptions of relationships at the university, and retention was improved. Dr Cory Laverty and Dr Nasser Salem from Queens university Ontario presented about developing a community of practice based on networking and working collaboratively with colleagues from across the university. Cory is interested in approaches to inquiry based learning and the role librarians can play in supporting this and initiatives to decolonise the curriculum from a perspective of academic development. They were asked to establish a working group for developing IL teaching, which was motivated by the adoption of a quality assurance framework. Librarians were expected to adopt this framework, but were unsure about how to measure learning from their IL teaching. This then led to identification that librarians needed to understand pedagogical theory, assessment as learning and learning design. Monthly meetings for a small working group took place over 4 years, and they developed learning materials for librarians, and workshops and development sessions to build teaching competencies. It’s very important that members of a community of practice feel comfortable with each other, so sessions were focused on being fun and engaging, and inclusive. Development sessions lasted 3 hours, and were centred on the learning needs of the group. People can feel vulnerable when sharing their practice, and it’s important to respect each other. Various evaluation data were collected over the 4 years as participants were asked about the value of the community. People liked that meetings were regular and facilitated, they liked that other professional groups were involved e.g. instructional designers. Resources were shared in an online repository. The group facilitated community building, and helped develop an identity, and there was authentic learning gained through sharing practice. A reflective approach in every session helped promote personal growth. Pam McKinney here again continuing live blogging from the LILAC conference. Anne Binsfield, a graduate of UCL, spoke about her masters dissertation research into new legal professionals transition into the workplace in terms of their IL experiences which is an under researched area. Transition from university to the workplace places new IL challenges on new barristers. Anne’s research focused on barristers undertaking pupillage, or those who had qualified in the last 2 years. The route to becoming a barrister is long and complicated, and involves many stages of advanced qualifications. Pupillage is a 12 month period of workplace training where they hone their IL capabilities and legal research skills. Anne took a qualitative research approach and interviewed 9 participants. Findings were that new barristers struggle with research, and have to focus on applying the law rather than critiquing it. New barristers have to find the right answer, and quickly, which is quite different from academic study. Being a successful researcher is an important aspect of professional identity, and many find it enjoyable. However they felt that university hadn’t prepared them for professional research, and for other aspect of how to behave as a barrister, including how to interact with clients and other legal professionals. New professionals need to develop new mediation strategies for Information problems. Training was seen to be irrelevant, but they did value self learning through experience and experimentation. Pupil supervisors were a useful source of information, as were other people in the workplace. It was important to ask the right information of the right person. Supervisors were important in involving the pupil in the professional milieu, to enable the pupil to build their knowledge of the environment and how to act effectively. WhatsApp groups facilitated peer support between pupils who had been at university together. Storytelling about experiences was another important aspect of sharing learning, and quickly building professional competencies and identities. So far from being a dry text based learning environment, actually there was a focus on social learning. In summary, IL at university is different to the IL needed in the workplace, and a new definition of IL is needed to reflect the complexity of IL in the workplace. Law librarians need to understand the situated learning aspect of new legal professionals. This is Pam McKinney live-blogging from the LILAC conference. 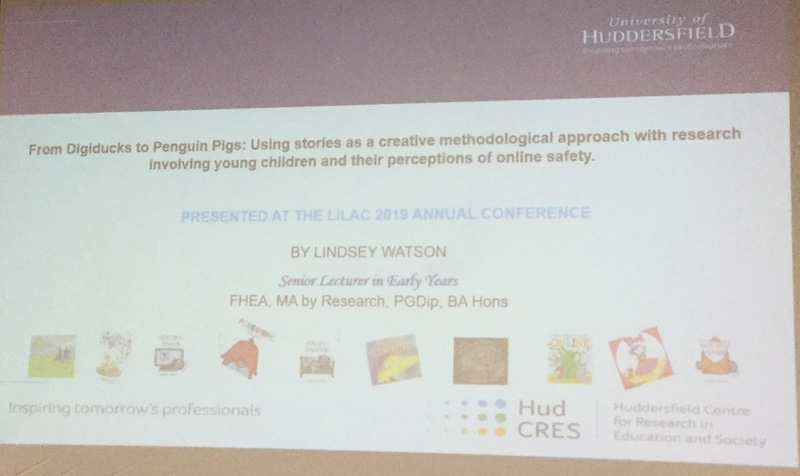 Lindsay Watson a senior lecturer in early years education from university of Huddersfield (@Lje1994) is presenting her doctoral research into storytelling as a research method with young children. It’s impossible to interview or survey young children, so you need a more fun and creative way to find out what they think. Online safety for children is a key issue, as children engage younger and younger and for longer amounts of time with devices such as iPads that are internet enabled. We have moved away from restricting access towards positively influencing children’s engagement, and recognise them as keen and able users. So we need to research children’s understanding of the internet, and this involves doing research WITH rather than ON children and to become co-constructors of knowledge. The overall aim of the PhD research was to examine how to tackle issues of online child safety, and to analyse child oriented creative research practices such as storytelling in eliciting the views of younger children within research, and to look at issues of consent, assent and dissent and how children make choices in the research space. Children are familiar with storytelling and it capitalises their desire to interact and connect with the content. It can encourage younger children’s voices, and is a much more relaxed experience for them. Nine children aged 4-5 took part in the research, who were based in one primary school in the UK. The children were read a wide range of age appropriate story books about online safety, following important dilemmas. Children were free to express their opinions and perceptions. Sessions lasted 15-30 minutes and had between 1 and 9 children taking part. In the next part of the session delegates were invited to read a selection of books and note down their thoughts on the style, story and how suitable we thought the books would be for young children. We thought some of the books were quite unsuitable for the age group, and contained ideas and metaphors that might not be appropriate. Some books present a negative view of children and their engagement with technology, but some were really successful at stimulating conversation with children about topics such as online safety and privacy. Some books covered activities that were a little advanced for 4-5 year olds but were useful for preparing children for activities they would do when a little bit older. Initial findings reveal that storytelling is a great way to engage children, but the researcher has control about the choice of book and can guide the interactions. 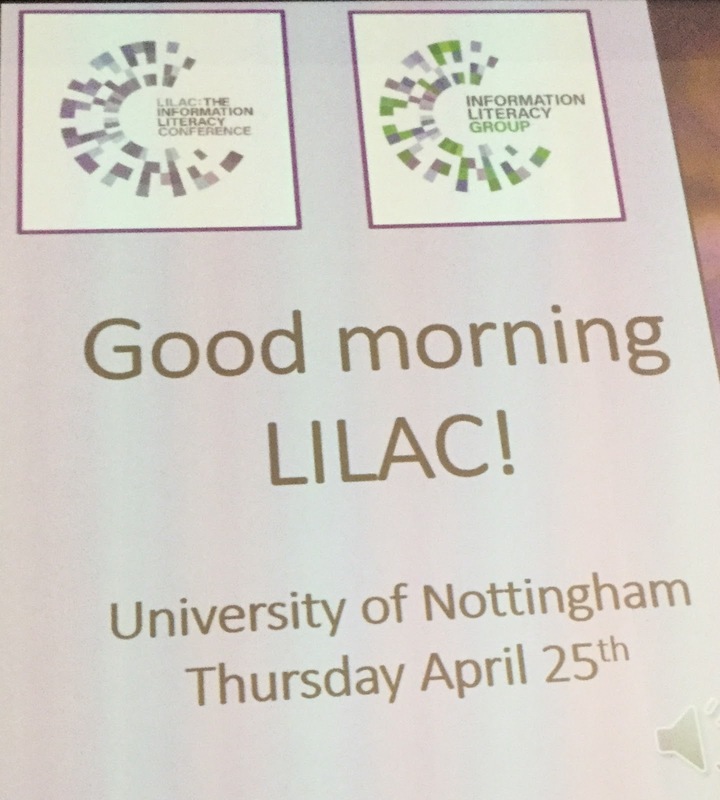 Hello, this is Pam McKinney and I’m at the Librarians’ Information Literacy Conference (LILAC) at the University of Nottingham for the next three days, and I will be live-blogging conference sessions for the information literacy weblog. 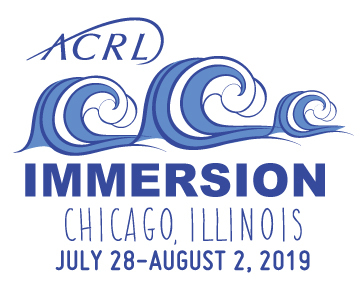 I’m sure there will be lots of great IL projects, research and teaching to share. This morning the first session is a keynote by Sandeep Mahal, who is director of Nottingham UNESCO City of Literature. Sandeep is proud to work as an ambassador for Nottingham as a UNESCO city of literature. 70% of us read for pleasure, and literature is a key cultural export of the UK. Sandeep grew up in a house without books, and left school with few qualifications. She went to university as a mature student, and believes passionately in the power of libraries to positively transform lives. She spoke about the literary history of the city of Nottingham, which includes Lord Byron, JM Barrie, Graham Greene and DH Lawrence. The city is home to many libraries and bookshops, and has a tradition of public education. Despite the climate of austerity in the UK, Nottingham has not closed its public libraries, and instead is planning a new central libraries. This positive environment for literature, books and reading was recognised by UNESCO and led to the designation of “city of literature”. However Nottingham has a lot of poverty, and high levels of inequality. By age 11, 15% of boys and 10% of girls are two stages below their expected reading level in school. While there are many BAME families in Nottingham, the low literacy levels are more closely linked to child poverty, not ethnic background. Sandeep spoke about the value of reading for pleasure for children’s educational attainment and future job prospects. Much work has been done to encourage reading and literacy, for example the “book start” programme where all new parents are given a book pack to read with their children. The Dolly Parton imagination library gifts a book a month to children under 5 in the most deprived areas of Nottingham. Young ambassadors review books, interview writers and promote books and reading across the city. Nottingham’s new central library will be a national centre for children’s learning and literacy, and young people will help design the space where they can socialise and learn. Information literacy development will be a crucial aspect of the new service.